Glam Morena: Site Review: Madame Madeline + Promo Code. Site Review: Madame Madeline + Promo Code. Madame Madeline is a website that offers discounted false eyelashes. The site offers brands like Ardell, Duo, Andrea, Revlon, and so many more. 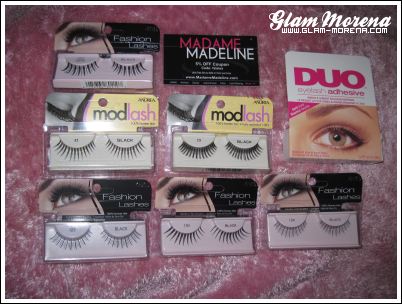 I got sent a few false eyelashes and an eyelash glue. Shipping was really quick. My package arrived in about 4 days. The more eyelashes you order, the more you can save. Madame Madeline offers dicounts and possible freebies when you place an order. Click here for more information on available discounts at Madame Madeline. It's a great site for those who are makeup artists and use falsies regularly. If you're a false eyelashes lover I would definitely recommend this site. Plus free gift with $20 or more purchase! Disclaimer: Madame Madeline provided me with the products mentioned in this post. I'm definitely bookmarking this site. I'm also going to bookmark this site. I need some new false lashes... Thanks! Whoa, that would be a cool site to visit.